PROVIDENCE, R.I. (WPRI) – Rhode Island officials on Thursday formally submitted their proposal to land Amazon.com’s much-ballyhooed second headquarters, suggesting seven locations where it could go and debuting a glossy website to promote the pitch. The Rhode Island Commerce Corporation said the possible local locations put forward for Amazon’s so-called HQ2 are Providence, Pawtucket-Central Falls, East Providence, Warwick, North Kingstown, Richmond and Woonsocket. Pryor said the state would not release documents disclosing the size of the tax breaks Rhode Island is offering Amazon if it puts the headquarters here. For a comparison, Worcester is said to be offering incentives in the neighborhood of $500 million. “We really want to let the company have a shot at reviewing it before we’re talking about every detail,” Pryor said. The 125-page document is on the new website under password protection. The state released renderings of the potential campus on the former I-195 land in Providence, and another rendering of a potential site in Pawtucket and Central Falls. Pryor said they wanted to provide a “menu” of options to Amazon. Pryor also emphasized a proposal for a so-called “Amazon Academy,” a partnership between local universities. “We envision Amazon employees obtaining the professional development and continuing education they need to advance Amazon’s goals through this initiative,” he said, adding that all the major colleges and universities are on board. Amazon has said the new headquarters would be equal to its original HQ in Seattle, and could reach 8 million square feet and employ 50,000 people with an average salary of $100,000. The eventual size of the campus would most certainly require infrastructure changes, Pryor said, but would begin with a smaller building for the first phase and grow from there. Major cities across the United States and Canada including New York, Chicago and Boston are also making bids for the facility, offering all the benefits of a major metropolitan area. But Pryor said Rhode Island has easy access to big cities like Boston and New York without the sky-high cost of living. He acknowledges the bid is a long shot, by virtue of how many other cities and states are competing to play host. CEOs of Rhode Island companies including Hasbro, Citizens Bank and IGT Global submitted their own videos for the new website, which also features a video of Gov. Gina Raimondo appealing to Amazon to choose Rhode Island. The cost to build the website and produce the videos was not immediately available. On Friday, Oct. 20, Democratic Senator Jack Reed also spoke with Eyewitness News about Rhode Island’s pitch to Amazon. He hopes the company takes a seriously look at the Ocean State for it’s skilled workers, schools and connectivity to other cities. In the above video, Eyewitness News reporter Eric Halperin speaks to Sen. Reed about the proposal. “This is not a wild conjecture that we could get it, but it’s not going to be easy, competition is going to be severe and we’re gong to do our best,” he said. Eyewitness News also reached out to each city in Rhode Island that has a pitch for Amazon. “The administration has put together a combined municipal/private-sector proposal which we believe is transformative, imaginative, creative, exciting and workable,” Woonsocket Mayor Lisa Baldelli Hunt wrote in part of a statement. 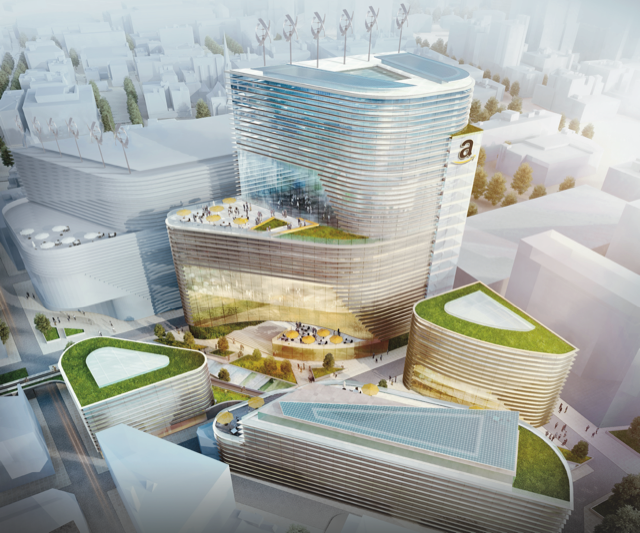 A state rendering of how Amazon HQ2 could look in Providence. A state rendering of where Amazon HQ2 could go in Providence.